Ever stood looking into your closet and felt like you have nothing to wear? Inspiration can come from a reorganization of your closet–I've found sorting by color can be an eye-opening experience–and tapping into one of the following apps. They'll help you put together great outfits, even taking the day's weather report into consideration. 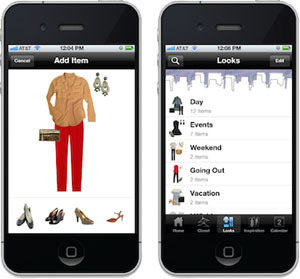 The idea for this iPhone and iPod touch app came from a fashionista who had more than 1,000 items in her closet and wanted to catalog the seemingly endless combinations she could put together. Cloth lets you add Instagram-like effects to your photos and encourages you to share photos of your favorite outfits with friends on Facebook, Twitter and Tumblr; the more you share, the more badges and points you receive. You can also tag outfits with descriptors such as “vacation,” “everyday” or “events” so as to pull up all related looks in one place. And, with a $0.99 in-app purchase, you can tag outfits with weather conditions, such as "Freezing" or "Rain," so you're automatically presented with outfits appropriate for the day's weather conditions. 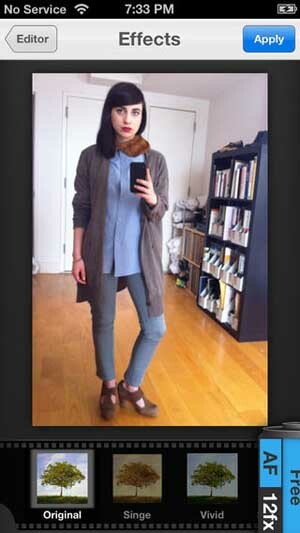 People who enjoy planning their outfits will appreciate Stylebook’s powerful features. Not only can you use your iPhone, iPod or iPad to snap photos of individual items in your closet, you can remove the image backgrounds and then pull the images onto a white canvas several items at once to see how they’ll look together. If an item you pull into the ensemble appears out of proportion on the canvas, the resizing tool lets you scale it down to the appropriate size. Stylebook lets you shop for new items and even has a calendar so you can commit to wearing a particular outfit days, weeks or months in advance. Want inspiration about low-tech gear that can help you organize your closet? Stylebook has some ideas. Stylicious has many of the same features as Cloth and Stylebook but for Android users. It lets you snap photos of your clothes, shoes and accessories and tag and categorize them to let you pull up similar items together. It includes a calendar to help you plan outfits and keep track of what you wore when. Stylicious is highly geared toward shopping and includes a copious fashion ideas, a tab in which you can see which items are most wished for in a handful of countries, and a handy feature that lets you bookmark particular brands and show you only items that are on sale. You can also share images you have stored in Stylicious on Facebook, Twitter, Pinterest and Tumblr. If you’re thinking about going further than just reorganizing your closet and looking into remodeling, Houzz is a web platform and mobile app you absolutely must try. It features more than 2 million photos uploaded by remodeling and design pros that you can save to idea books. At the moment, for example, a search for the term “closet” returns nearly 50,000 photos. If for example you wanted to see only photos of shoe racks, Houzz offers more than 1,300 unique ideas. If you need professional help with your project, Houzz lets you filter its community of professionals according to location and type of service you need as well as which services have been recently reviewed or most reviewed. Of course, when organizing your wardrobe, there's bound to be a few things you don't wear anymore. For your designer clothes, a quick and easy way to turn your clothes into cash is the Sold app. For other items, you can always go the eBay route.